WWE SmackDown Results (4/2): WWE Title Contract Signing, More! 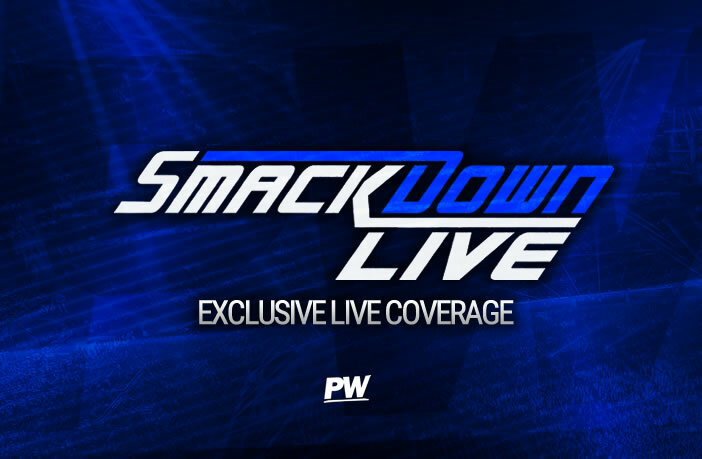 We are kicking off the WrestleMania go-home episode of SmackDown Live with the latest Kevin Owens Show as he welcomes his guests, Randy Orton and AJ Styles to the show. KO starts out by pointing out fans were looking forward to Kurt Angle vs AJ Styles last week, adding that Orton stopped that from happening. The Viper says he is proud of what he did, he stopped the world from seeing a washed-up former Olympian from beating a man who thinks he is at the top of the game. AJ then points out that Orton has been in the company for nearly 20 years and only learned one move. Orton responds that when you have a move that is that deadly, that is all you need. He says the fans think these indie guys have it so hard, going from high school gymnasiums trying to impress dozens of fans, whilst he was performing at WrestleMania’s. AJ agrees with that point but says Orton was busy getting suspended for failing drug tests which gets a huge pop from the crowd. Orton says that the truth is, if AJ was as good as he thinks he is, he would have been in the WWE a long time ago. Orton adds that AJ’s legacy isn’t that hard work pays off, it is that he has assumed John Cena’s role as corporate b*tch. Kevin Owens decides to jump out of the ring at that point as the two men square up and a classic WWE talk show brawl breaks out which ends with AJ going for the Phenomenal Forearm which was countered into a huge RKO. This one gets underway with Ricochet and Cesaro and whilst the NXT Superstar looks to fly high, the power of Cesaro proves too much as he blocks Ricochet’s offensive move and then rocks him with a huge uppercut as he brings in Sheamus. The Celtic Warrior continues the aggressive offence but Ricochet tags his partner in who quickly brings in Jey Uso, but Sheamus manages to drag him back to their corner, tagging in Shinsuke Nakamura who starts going toe to toe in strikes with Jey. Rusev manages to make a blind tag which Jey clearly doesn’t see as he ends up getting sent over the top rope as Rusev starts tearing apart Jey outside the ring, launching him into the stairs and the barricade. Jey looks to finally make the tag but Sheamus enters and stops him as the heels continue to dominate one half of the Tag Team Champions. Rusev and Nakamura continue to isolate Jey Uso but he finally hits a Samoan Drop and tags in his brother as Jimmy Uso takes out everyone on the apron and rocks Rusev with a Superkick, but Nakamura is in to break up the cover. However, this leads to a total match breakdown as each man comes in to hit a move on each other, eventually clearing the ring back to Jimmy and Rusev and he tags in Jey Uso as they hit a double superkick to defeat Rusev and pick up the win for their team. Following the match, the host of WrestleMania arrives, Alexa Bliss! The Goddess says the one thing she has noticed is that SmackDown has lost its spirit of competition, and the case in point is The Usos. She points out that last week they forfeited their match against The New Day, and Bliss says that is so deserving of repercussions. Bliss announces that The Usos will be defending their SmackDown Live Tag Team Championships against all the teams in the previous match which leads to a huge brawl from everyone as Ricochet flies over the top to take out everyone as he and Black stand tall!